How to find the quadrilateral area? 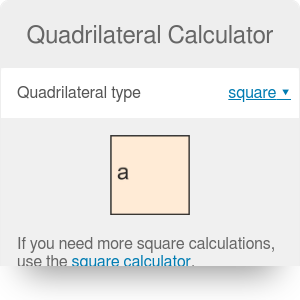 If you are wondering how to find the area of any quadrilateral, check out this quadrilateral calculator. We implemented three quadrilateral area formulas, so you can find the area given diagonals and angle between them, bimedians and angle between them, or all sides and two opposite angles. In the default option you can also find the quadrilateral perimeter. If you are looking for a specific quadrilateral shape - as, for example, a rhombus or a kite - check our comprehensive list of area calculators below. Irregular quadrilateral (UK) / trapezium (US): no sides are parallel. That's the case in which our quadrilateral area calculator is particularly useful. Trapezium (UK) / trapezoid (US): at least one pair of opposite sides are parallel. Isosceles trapezium (UK)/isosceles trapezoid (US) is a special case with equal base angles. Parallelogram: has two pairs of parallel sides. Rhombus or rhomb: all four sides are of equal length. Rectangle: all four angles are right angles. Square: all four sides are of equal length (equilateral), and all four angles are right angles. where a, b, c d are quadrilateral sides, s is the semiperimeter (0.5 *(a + b + c + d)), and angle1 and angle2 are two opposite angles. Assume that you want to calculate the area of a parcel. It's in the quadrilateral shape, but not any specific - it's neither a rectangle, nor a trapezoid. The quadrilateral area calculator is the best choice! Choose the option with your given parameters. The easiest to measure in field or on the map is the default value, with 4 sides and 2 opposite angles given. Let's pick that option. Enter the given values. For example, a = 350 ft, b = 120 ft, c = 280 ft, d = 140 ft, angle1 = 70 , angle2 = 100. Remember that you can easily change the units by clicking on the unit name and selecting the one you need. The quadrilateral area calculator displays the area, as well as perimeter. The area is equal to 39,259 ft2 and perimeter 890 ft in our example. Now you know how much material you need to fence the parcel. Quadrilateral Calculator can be embedded on your website to enrich the content you wrote and make it easier for your visitors to understand your message.